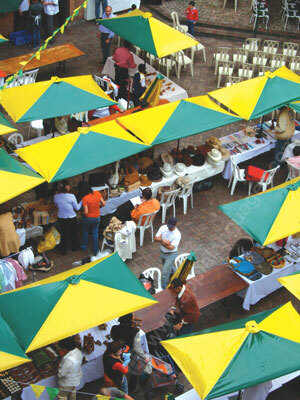 Bogotá is one of the most historic, culturally-rich cities in South America! It’s also blessed with the spectacular skyline, wide shopping boulevards, and ceaseless nightlife of any major capital city. 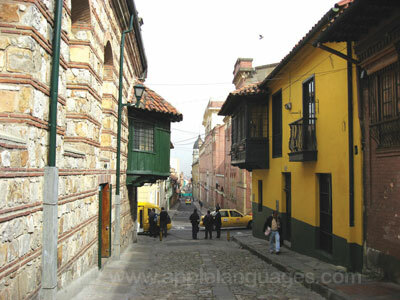 You’ll always find something new and exciting to do if you take a Spanish course in Bogotá! Located in the heart of Chapinero, Bogotá’s financial district, the school is surrounded by restaurants, cafes, and bars for all budgets. You’ll find yourself within walking distance of Zona G – or the gourmet district’ – Zona T – a great area for bars and nightclubs – and Zona Rosa – home of shopping malls and high-end boutiques. Often overlooked in favour of more tourist-focused areas, Chapinero is rapidly becoming the city’s go-to area thanks to its modern, youthful vibe. With indie coffee shops, vegetarian restaurants, and the largest LGBT+ club in South America, the district offers excitement and entertainment by the bucket-load. There is always something going on, and its central location makes it an ideal focal point for your Colombian study adventure! 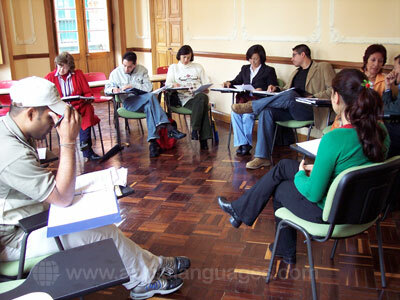 Your Spanish lessons in Bogotá will take place in a bright, newly-renovated building in the intellectual heart of Chapinero. Surrounded by university buildings and colleges, you will be hard-pressed not to feel the study-buzz! Just a few minutes down the road you will find the Avenida Chile shopping centre, an ideal spot for some retail therapy after your morning lessons. Tread just a little further and you will enter the vibrant Zona G, and from here it’s just a short walk to Quebrada La Vieja, a verdant oasis on the edge of the city offering picturesque views across the savannah. Facilities at the school include 11 spacious classrooms, a student lounge and computer room, and on-site parking. The building also provides easy wheelchair access for students with disabilities or limited mobility. What’s more, local students learn English in the same building, so you can practice your Spanish with Colombians! 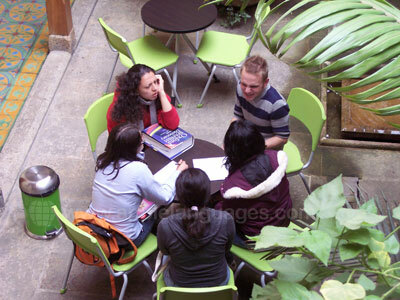 Our most popular Spanish course in Bogotá is the Standard Course of 20 lessons per week. All classes run from 09:30 to 13:30, giving you most of the afternoon to explore the city! The maximum number of students per class is only eight, so your teachers can dedicate lots of time to each individual student. If you require even more personalised and intensive tuition, our school also offers Private Spanish Lessons, with completely flexible timetables. You can take Private Lessons on their own, or as a supplement to a Standard Course. 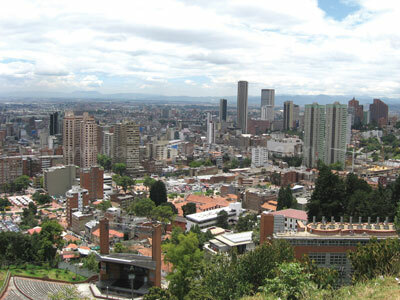 Help the local community as you learn Spanish in Bogotá – join our school’s Volunteer Work program! You’ll attend the Standard Course in the morning, followed by afternoons spent helping children, elderly persons or refugees. The minimum duration of the program is four weeks, during which time you’ll rapidly improve your language skills, and gain valuable insight into the local way of life. There’s no better way to learn Spanish than by living with a Spanish-speaking family whilst you study. Mealtimes are perfect for practicing your Spanish with your hosts – choose a bed & breakfast arrangement, or breakfast plus an evening meal. Families are chosen for their hospitality and the quality of their accommodation, as well as their location. If you’d rather prepare your own meals and socialise more with other students, our school also arranges accommodation in private apartments close to the school. All apartments are fully furnished and cleaned on a weekly basis. 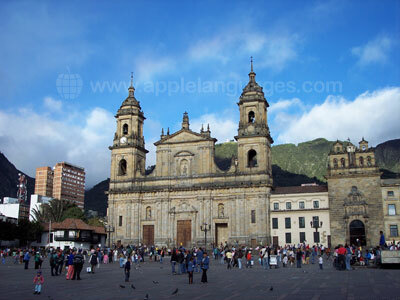 Have an unforgettable time in Bogotá with our school’s varied program of activities! Typical activities include guided tours of the city, school parties, Spanish movie nights, museum trips, and excursions to Colombia’s wonderful natural parks. Put your Spanish to good use and make new friends as you explore Colombia! Our school will gladly collect you from Bogotá Airport, although this service carries an additional charge. I found the course very helpful and it increased my abilities. I like it that the staff was very flexible in the planning. We had to visit clients but we didn't exactly know when. It was easy to plan the lessons around our schedule. Friendly and well run, professional school. Great teachers. Maybe there could have been more pressure to do homework and learn the grammar, but a lovely school and a great atmosphere. I stayed in a private flat attached to a friendly family. Had a great time and my spanish improved loads!